Wedderspoon's popular 100% Raw Manuka Active 12+ Honey also comes in a larger size jar for those who already enjoy snacking on a 100% natural product that is full of nutrients and antioxidants. The honey is independently tested according to Wedderspoon's own guidelines. 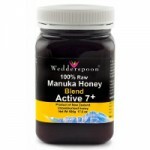 Wedderspoon's most potent manuka honey - a delicious honey with high antibacterial activities that have been tested independently. If you are looking for a manuka honey with high antibacterial properties why not give this a try.